It is the beginning of a new decade. This offers each of us a fresh start! Some of us tell ourselves all sorts of reasons why we can't do something. If it isn't the economy, it is our health, our spouse, our lack of knowledge, our energy level, our lack of time or money -- or some other obstacle that we have created for ourselves. Source says this is the time to step into a different kind of creativity and innovation -- and for all of us to let go of our internal stringencies, rules and regulations that have stopped us in the past. Source says, "Let's get on with the business of living well. I have much that I want to experience through each of you. Who do you think gives you these dreams and desires anyway?" You are me and I AM you." Two doors are placed before us at all times. We are in free will and choice in a world of apparent duality. The left hand door has energy behind it that is inert and which drains us. We may feel tentative, uncertain, confused -- even ill It is filled with wonderful information that we have made the wrong decision for this point on our journey -- the moment we realize that we are presented with two more doors. The door on the right is filled with Light. When we step through that door we are filled with courage, peace, a surety that we made the decision for our Highest Good in that moment -- and that we are on our right path. Sometimes it is easy for us to confidently step right up and walk through the Light-filled door. At other times, we cannot discern which door is which. These are important times for quiet contemplation and conversations with Source. In order to receive clear Guidance, we may need to calm ourselves, to slow down and cultivate patience in order to wait on God. When we choose to do this we have already walked through a Light-filled door. Sometimes it may chafe us to wait to hear the often quiet whisper of Source. It is a little-known secret that, as we build this practice of intent listening, Source seems to speak more loudly and frequently. One of the reasons the voice of Source appears to be so soft at first is because we have built our skill in NOT LISTENING. We have often deadened our ability to hear, feel and see Source by placing our constant attention on third-dimensional reality. To change that way of being is to walk through the Light-filled door. All spiritual mystics throughout time discovered this secret. When we become quiet internally as a matter of choice, we create the space for Source to communicate with us. Practice is the answer to everything that seems difficult before we have mastered it. Sustained, sincere practice -- showing up for our relationship with Source -- can become a delightful habit in almost no time at all. We automate it in the prefrontal cortex of our brain and it becomes part of our life. The life that is available to us in consistently choosing the most Light-filled door includes health, abundance, work that we love, people in our lives that we treasure and who see who we really are and affirm that, deep inner peace, clarity, laughter, joy -- and the ability to let go and flow with the River of Light that is Source. You may know people like this. They are filled with radiance. The Light pours out of their eyes and their chakras just as it flows out of the cracks around the Door of Light. They are healthy, they have abundance, their lives are filled with love. You will know these people by their 'fruit' -- what they have manifested in their reality. They live in Truth. If you are not already, you can be one of them. The door is open. Life is Light and Light is Love. Let your God-Self come forth and LIVE. We truly are living in the most exciting of times. Why you wonder, might I be making that claim considering the seemingly bleak news of the day? At any given moment humanity appears to be teetering on the brink of utter disaster, economically, environmentally and globally. I'm not disputing the fact that our planet and many people are feeling profound suffering. But I also know that at the depths of the greatest despair is where we shine as individuals, rise to the occasion as community and discover a strength we may not have known, exists. One year ago, a friend from a business group to which I belong, suggested that I meet a woman she knew. When I pressed her for more information her answer was at the most...vague. Being the adventurous sort, I threw caution to the wind and decided to give this woman a call despite the fact I wasn't sure what I was calling about. On the way to her home, I got lost several times which made me wonder if the Universe was trying to tell me something, such as "Turn Back!" Well, I didn't and eventually I did find my way to Ashley Warrenton-Smith's beautiful home. A most welcoming smile and warm blue eyes greeted me at the front door. No one can deny that Ashley radiates light and joy and the moment I saw her, I felt an immediate connection. In the midst of our conversation, I described my new Acupuncture and Holistic Nutritional practice in San Anselmo, California called Modern Alchemy Acupuncture. Besides traditional acupuncture I also spoke to her of an esoteric form of acupuncture, which I practice and which was taught to me by its founder, Dr. Mikio Sankey. I explained that traditional acupuncture focuses on the physical body and prevention of disease while Esoteric Acupuncture's emphasis is not on the physical body but on raising consciousness. This is done by needling various geometrical patterns, which unlock latent codes held within each person. In essence, Esoteric Acupuncture helps people, "wake up." I happened to have Mikio's latest book in my backpack, turned it to the back cover and showed Ashley a picture of him. I expected a polite nod and to continue our conversation but instead Ashley began to cry. Recognition, deep love, remembrance...that was the meaning behind her tears. Ashley felt strongly that she had known Mikio in a past lifetime and I had no reason to doubt her as my body tingled with goose bumps from her words. Listening to Ashley speak about the Dancing with Source™ work, made me realize how many parallels existed between DWS and Esoteric Acupuncture. Both modalities are aware that the obvious is never the real reason for our physical problems. There is always a deeper energetic reason at the core. Both focus on a new paradigm of healing created by the transmutation of our lower vibrational frequencies into the higher refined energies. And both are ultimately about re-awakening to what we are meant to be doing on this planet and our connection to Source. Mikio likens this to "finding our own unique puzzle piece" or the assignment that we agreed to take on before we incarnated to assist in the advancement of humanity. As Ashley spoke of her work, I knew that not only was my own relationship to her important but I intuitively felt that the combination of DWS and Esoteric Acupuncture could be a powerful duo for healing at the deepest level, the level of Spirit, and ultimately the healing of the planet. I enrolled in Ashley's "Advanced Energetic Healing Workshops"...just in the nick of time. Unbeknownst to me, the next twelve months would prove to be some of the most challenging in my life. I am forever grateful that DWS, its amazing community of students and practitioners and, of course, Ashley were there to support me through it. 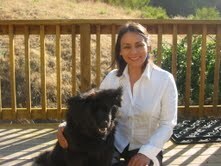 In February, 2009, about a month after I started DWS, I was out hiking with two of my dogs on a beautiful trail on an exquisite Marin morning and within an instant my life changed. All I remember was a strange crushing sensation in my foot. Perhaps the way one would feel once their feet hit pavement after falling from a multi-story building. The next thing I knew I found myself down the side of a hill. Looking up I could see two sets of black dog noses looking down at me from where I had been a few seconds before. The image was quickly erased when a tremendous pain began to emanate from my right foot. After several minutes of yelling for help someone found me and I was rushed to the hospital with a broken and severely dislocated ankle and ruptured tendon. I ended up mostly housebound for 3 months with a titanium plate and 6 screws as permanent fixtures in my body. Everyone called to console me. Ashley didn't. She called and in a very loving way, after asking my permission, shared with me why this had happened from an energetic perspective. Again, I felt a deep knowing that what she was saying was true. In subsequent months, I came to look at my accident as a type of initiation and opportunity. I grew tremendously from the experience especially as I did more of the DWS work. Not only did my ankle heal in record time, according to my doctor but during this time, I was able to move through and release certain judgments which I had carried since I was a child. I was able to access information from a Guide who I had seen in dreams since childhood. I even began to be able to access my own past lives and apply them to healing aspects of myself. Not only was I healing physically, but emotionally and spiritually as well. What I didn't realize was that this was only the beginning. Six months later my husband's mother died. Two weeks later, my own dear father passed away after suffering a fall ... the same day my oldest sister died from complications of diabetes. Two months after that, my sister's husband passed as well. If that hadn't been enough, just over a year before, my 36 year old nephew had contracted a rare blood disease and had passed on, leaving a gaping hole in my brother and sister-in-laws' hearts, as well as ours. These losses were difficult as you might imagine and often my chest felt as though a raw wound ached near my heart. But with the emotion also came a surprising equanimity and strength, which I attribute, in large part to the DWS work. I can't say it was this specific process or that one which supported me through this time. But I have become very aware that this work affects us on so many different levels, most of which I do yet understand. What I do sense are the changes occurring underneath my conscious mind. In the deeper realms of my subconscious, my dreams, in the moments before waking, I know something is being transformed. Although the unseen world remains visibly hidden to me, I can sense it living around me as my intuitive abilities are expanding. My dowsing rod has become a permanent fixture in my office and I use the DWS techniques when I am Guided to do so. I am looking forward to the day when I can combine Dancing with Source™ and Esoteric Acupuncture in an even more powerful way to benefit others. In the meantime, I'm happy to wait for Guidance and know that the more I heal myself and expand my own conscious awareness, the greater I can be of service to anyone who walks into my office. They in turn will be of benefit to all with whom they come in contact. After all, each of us is like a cell in the larger body of the Universe, working individually and collectively to support the whole. Or as Mikio likes to say, "We are all puzzle pieces." Once we figure out what our piece is and how we fit together, can you imagine the amazing picture we can create? We truly are living in the most exciting of times! that One I call to and know.